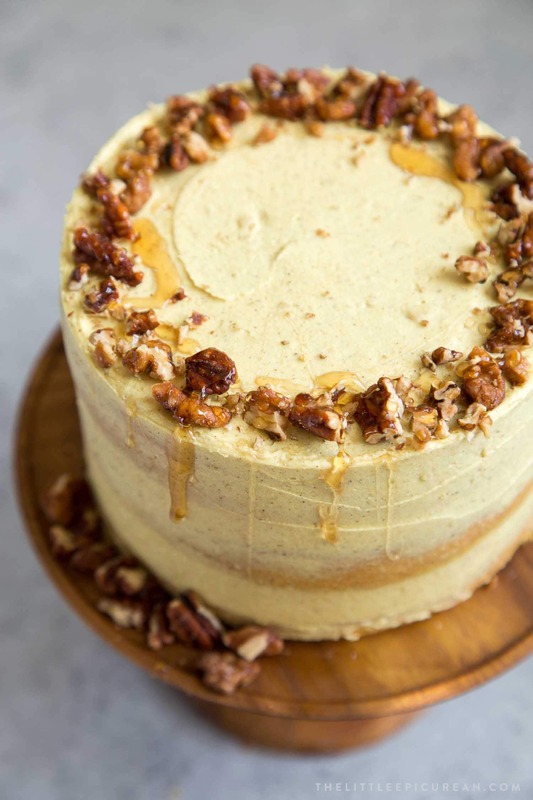 The iconic warm spices of golden milk are translated into this sweet Golden Milk Layer Cake topped with chopped candied nuts. Remember when golden milk was all the rage circa 2016? Also known as turmeric tea or turmeric latte, it seemed like everyone had forgotten matcha and coffee and moved on to this golden concoction. I, too, jumped on the band wagon. A warm cozy cup of golden milk became my go-to bedtime drink during the winter. The combination of spices with frothy milk and a drizzle of sweet honey, made golden milk the perfect night cap on cold nights. As the weather finally cools down in LA, I’m ready to revive my golden milk rituals. Why simple drink golden milk when you can also eat it?! 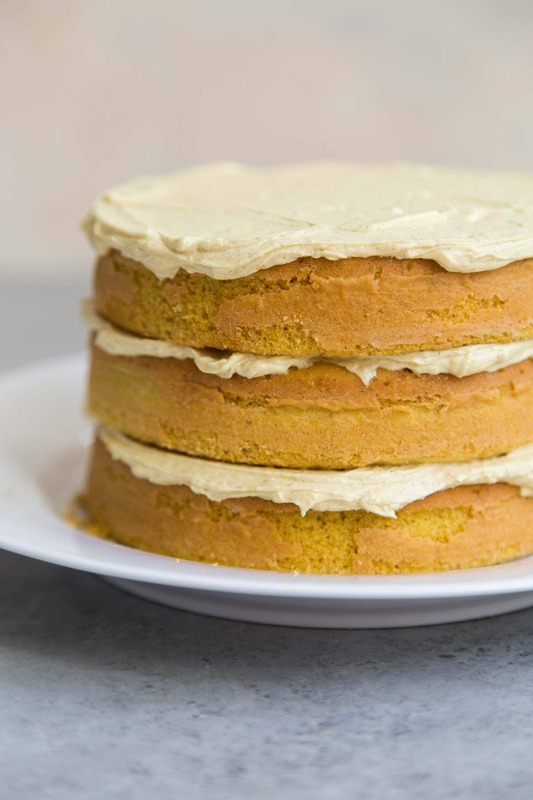 This golden milk layer cake takes all the flavors of turmeric latte and turns it into a luscious, sweet, decadent dessert. I can’t promise the same anti-inflammation benefits as turmeric tea latte. This cake won’t improve your digestion. It won’t boost your immunity. 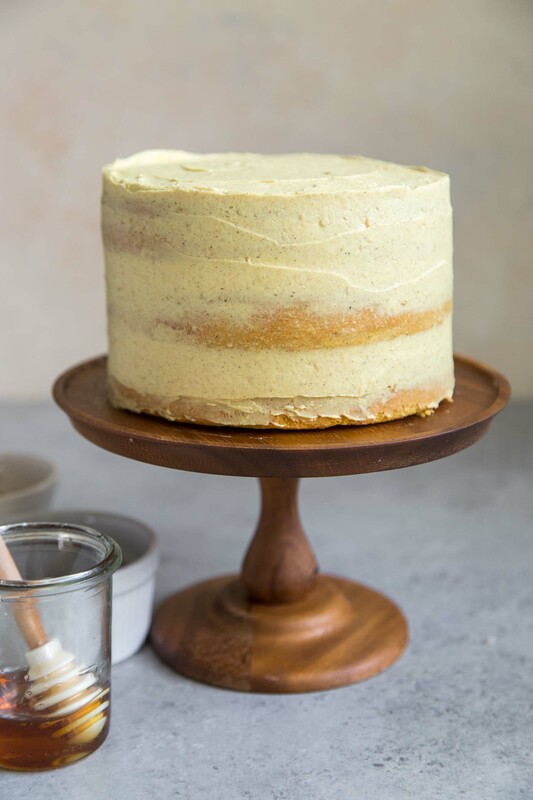 However, I can guarantee, this sweet golden milk layer cake will make your taste buds jump for joy. And, you’ll definitely get a sugar rush! Golden milk is a simply a mixture of milk and ground turmeric. Turmeric is responsible for that iconic golden hue and the drink’s touted health benefits. Turmeric and milk are the two staples. The choice of milk is up to you: regular cow’s milk, coconut milk, almond milk, soy milk. But the real choices come with the spices. Depending on who you ask, there’s a bunch of spices that play supporting roles in golden milk. These include: cinnamon, ginger, black pepper, cardamon, and cloves. 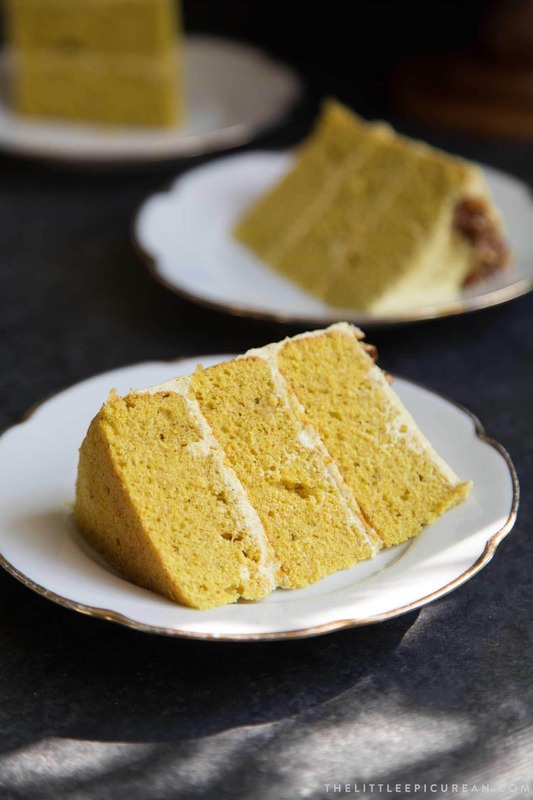 The recipe for this golden milk cake makes three 6-inch cake layers. It can also be baked in two 8-inch cake pans. The cake batter is spiced with ground cinnamon, ground turmeric, ground black pepper, and grated fresh ginger. I used coconut milk to thin out the batter. Regular cow’s milk or soy milk can be used it’s place. I used a standard American buttercream ratio (unsalted butter mixed with powdered sugar) and added cinnamon, turmeric, and a touch of honey. I am not a fan of powdered ground ginger. Perhaps I haven’t found the right brand. I don’t like the way it tastes or the way it smells. As a result, I used fresh grated ginger for this cake recipe. Use 1/4 teaspoon ground ginger as a substitute. I love turning my favorite drinks into cakes and other desserts. Interested in more tea inspired cakes? 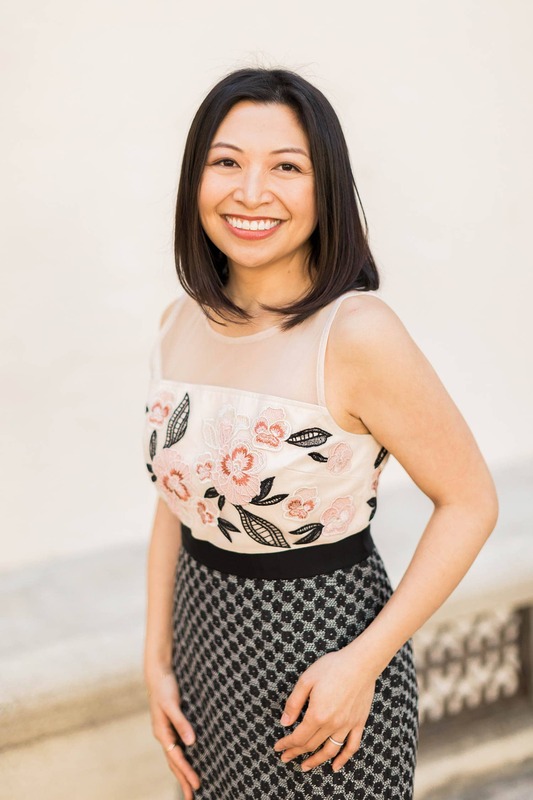 Check out: boba milk tea cake and Vietnamese coffee poke cake. 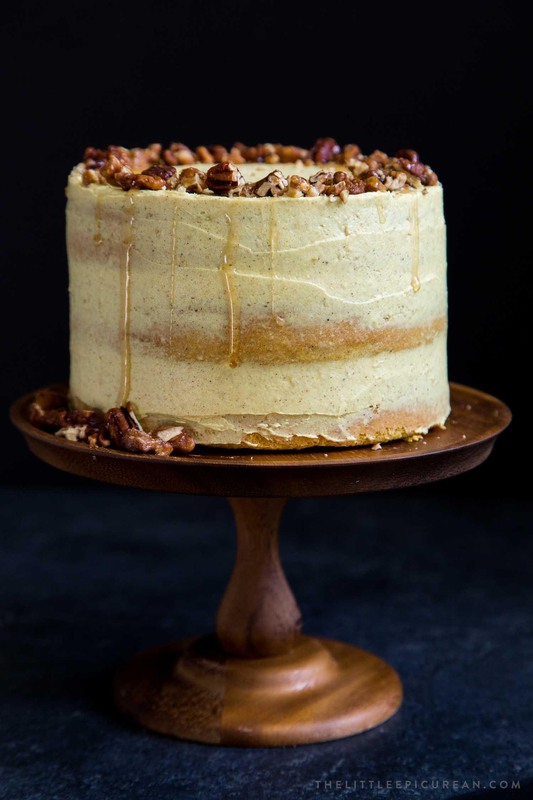 The iconic warm spices of golden milk (turmeric latte) are translated into this sweet Golden Milk Layer Cake topped with chopped candied nuts. Preheat oven to 350 degrees F. Butter and lightly flour three 6-inch cake pans. Line bottom with parchment paper and set aside. Sift together cake flour, baking powder, salt, cinnamon, turmeric, and black pepper. Set aside. In another bowl, whisk together fresh ginger, milk, egg whites, and vanilla until smooth. Set aside. In the bowl of a stand mixer fitted with a paddle attachment, beat butter and sugar until smooth. Scrape down bowl as needed to ensure thorough mixing. Add 1/3 of dry flour mixture. Mix on slow speed while adding 1/2 of liquid mixture. Adding another 1/3 of dry mixture, follow with remaining liquid mixture, end with remaining dry mixture. Mix until batter is well combine. Scrape down bowl as needed. Divide batter evenly among prepared cake pans. Bake for 30-35 minutes until toothpick inserted in center of cake comes out clean. Let cake cool in pan for 5 minutes before unmolding. Allow cake layers to cool to room temperature on wire racks. If necessary, use a serrated knife to level off cake layers once cake has completely cooled. In the bowl of a stand mixer fitted with a paddle attachment (or using a hand mixer), cream butter until smooth. Add powdered sugar, cinnamon, and turmeric. Mix on low speed until incorporated. Scape down bowl as needed. Add coconut milk, honey, and salt. Mix until thoroughly combined. Place one cake layer on cake board or serving plate. Spread layer of buttercream over cake layer. Repeat with second and third cake layer. Spread thin layer of buttercream around the exterior of assembled cake to seal in crumbs. Chill in the fridge to set up. If desired, add another coat of buttercream. Keep cake chilled in the fridge until ready to serve. Allow cake to sit at room temperature for 30 minutes before slicing. 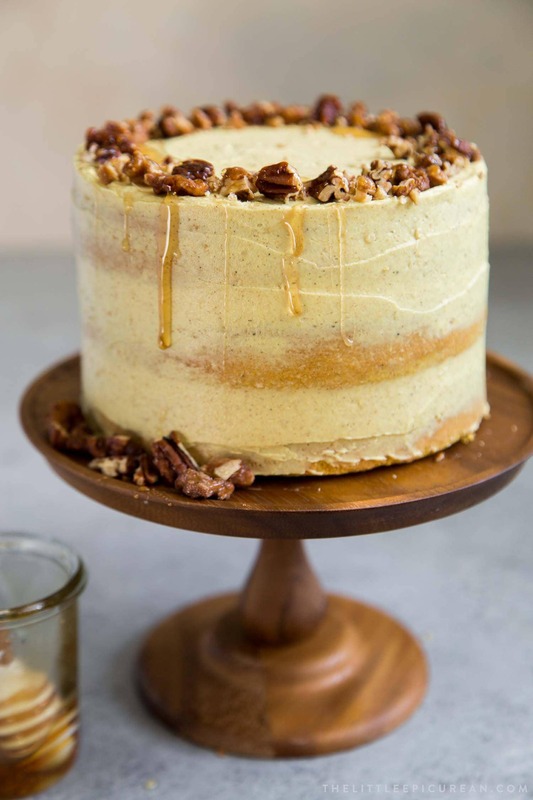 Be serving, garnish cake with candied nuts and a drizzle of honey. If using ground ginger, sift together with other dry ingredients.